Half-length portrait of Samuel Chandler in a grey wig, seated in a green chair with scrolled wooden armrests. Chandler is dressed in black ecclesiastical robes with white shirt cuffs just visible and white square bands. His left hand is held on the armrest of his chair, the right holds a quill pen. With the arm resting upon a table upon which are books and papers. Four volumes are shown upright, spines to the viewer, left to right: “STRABO”; “ROCHARTI OPERA”; “HERODOTUS”; and “BIBLIA HEBRAICA”. Another volume is opened before Chandler and is headed: “AESCHYLI TRAGOEDIAE”. Behind these volumes is a green curtain. 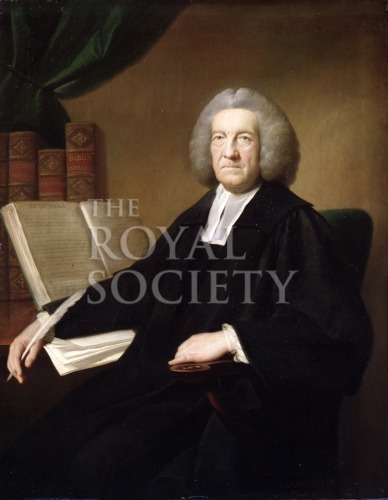 Samuel Chandler was elected a Fellow of the Royal Society in 1754. Presented by the executors of John Chandler FRS (1700-1780), 1781. Recorded on Council Minutes: “Mr Belchier presented in the name of the Executors of the late Mr.John Chandler F.R.S., a portrait of his Brother, Dr.Chandler which he said Mr. John Chandler hath bequeathed by his will to the Royal Society. Resolved. That thanks be returned to the said Executors.” [Royal Society Council Minutes, Original, CMO/7, meeting of 1 February 1781, p.63].